Want a more energy-efficient roof but don’t want to install those unsightly black panels everywhere? Fortunately, the new age of solar reflectivity is here and it’s looking better than ever! The cutting-edge cool roof system offers both energy savings and great curb appeal. So what is a cool roof system and how does it work? Cool roof is an innovative roofing system that reduces the heat transfer to a building while also radiating absorbed solar energy. It starts by delivering high solar reflectance. This means that the cool roof materials are able to effectively reflect visible, infrared and ultraviolet wavelengths of the sun. This makes your roof cooler! A cool roof also offers a higher thermal emittance meaning that solar energy that is absorbed is more easily radiated back out. In the past, consumers only had white or light shaded options when it came to their cool roof system. Now though there is a much broader color selection including darker materials that more closely resemble traditional roofing shingles. One brand making big advancements in the cool roof industry is CertainTeed. Their Landmark Solaris® and Presidential Solaris® residential lines are redefining the world of solar reflectivity offering dark, rich hues for cool roofing which also meet EnergyStar® qualifications. Less wear and tear on your air conditioning unit as the home stays cooler more easily. Cool roof systems are more functional and attractive than ever before. If you have considered solar panels in the past, now is the time to give them a second look. 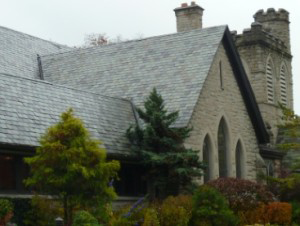 Custom Installations is proud to carry the CertainTeed brand of roof shingles and other building materials. With experience on our side, we can help update your Chicago home with an energy-efficient cool roof system. To learn more about Custom Installation’s roofing services, visit us here. Since 1969, we have helped thousands of Chicago homeowners with all of their exterior needs. From roofing to siding and more we are the preferred Chicago contractor for those looking for quality and excellence in their next professional partner.